Our last day in Macau was relaxed compared to the past two days. We even started later than the usual: 9:45am. Our first destination was Mandarin House, a restored traditional Chinese-style compound. Tucked in an unassuming street surrounded by Western-style buildings, it’s a gem. 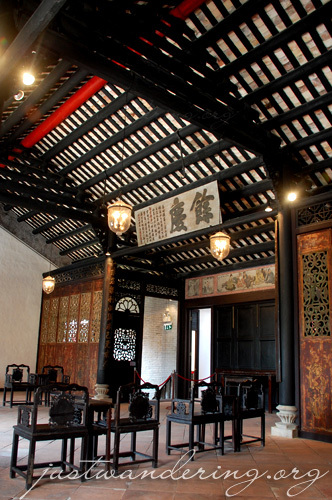 Built around 1881, this former residence of Zheng Guanying has been restored to its former glory. It was only open to the public this year, so the Mandarin House is pretty bare. 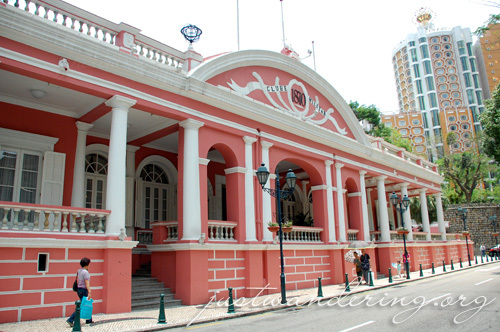 Still, it’s an interesting stop and a great addition to Macau’s heritage sites. 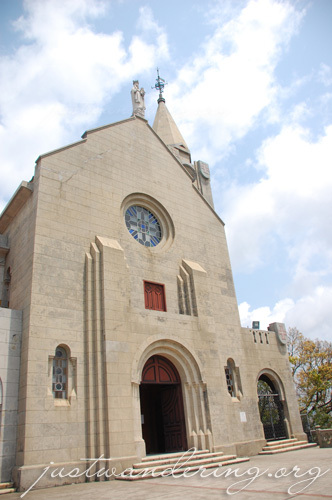 Next in the itinerary was Penha Church atop Penha Hill. João tells us that when the Portuguese were still in Macau, they would stop their ship as they pass the church and pray for a safe voyage. The Chinese have a similar ritual, but they would do it in front of the A-Ma temple. 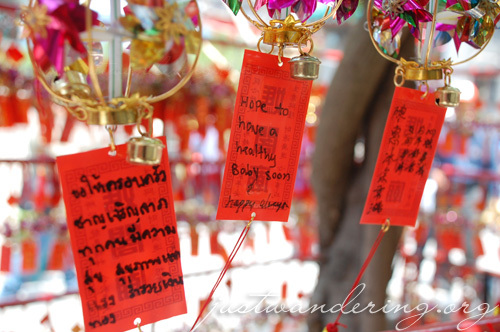 The temple honors Matsu, the goddess of seafarers and fishermen. The A-Ma temple is another popular tourist destination in Macau, as evidenced by the throngs of people within the temple and the long lines of tourist buses waiting for their turn inside the temple’s parking lot. Though most of the visitors in the temple are Chinese, there are also a handful of other nationalities poking through the temple and trying their hand at various temple activities. 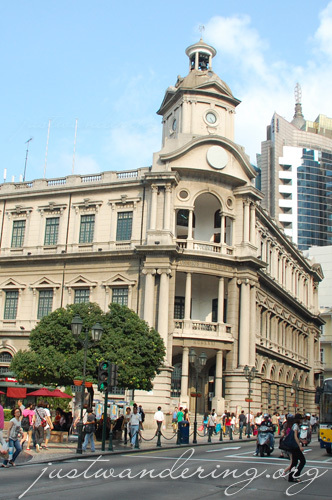 The Macau Maritime Museum is right beside the A-Ma temple. The museum has a very fitting location: it fronts the sea and it provides cool airconditioned comfort when it gets too hot in the temple. 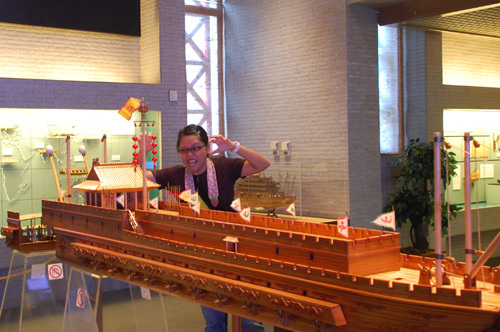 On exhibit are different replicas and dioramas of anything and everything related to traveling by sea. The museum showcase both the Chinese fishing boats and Portuguese ships and the vessels that thread the waters around Macau. Monster on the port side! Before we left, we (along with hundreds of tourists) were treated to a demonstration of traditional Portuguese dances right in front of the A-Ma Temple. 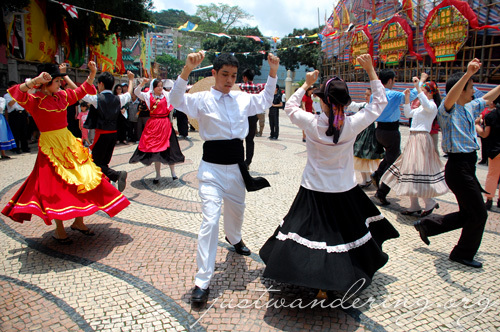 Portuguese, Chinese and Macanese youth volunteers were dressed in different Portuguese costumes and danced to different Portuguese folk dances. We headed to the Macau Military Club for lunch. What was waiting for us was the traditional Portuguese Sunday fare: Cozido a Portuguesa. It’s basically a meal that combines different kinds of sausages and meats, chicken, pork and beef. It was a buffet so you can pick your choice of meat. It was our first encounter with Portuguese-style sausages. I couldn’t remember the names of the two other sausages served, but I took quite a liking to the Portuguese blood sausage. The cozido is quite a heavy meal. Traditionally, it is followed by a siesta. Thankfully, our itinerary allowed us to have a siesta — we had free time after lunch. It was a fine day, and though Sofitel’s sparkling pool was beckoning to me, I opted to finish packing and have that siesta. We checked out at 4pm and went to Senado Square for some last minute shopping. While the rest of the group finished off the remainders of their Patacas, I went on my own to Macau Tower. This was the last stop in our itinerary, and though the group will be going there at a later time, I had to be there by 5pm because I booked for a bungy jump at 5:30pm. The bungy wasn’t part of our itinerary. I figured since I was in Macau already, I might as well try it out. Macau Tower stands at 338 meters (1,109ft) from the ground to its highest point. At the 61st level is an outdoor observation deck, which is also where AJ Hackett set up shop. 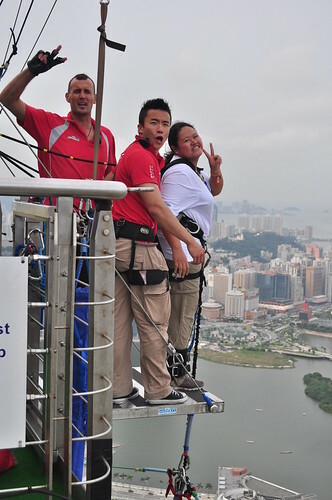 The company operates several high altitude activities in the tower: SkyWalk X, Sky Jump, Mast Climb, and of course, Bungy jumping. At 233 meters above ground this is the highest commercial bungy jump in the world. The fee for one jump is whopping MOP 1,718 fee — something that made me think and re-think this over and over throughout the trip. It took me almost an hour before I got to jump and the group arrived just in time to see me bounce in the air. It was exhilarating and was over too soon. In no time, I was back on the 61st level, changing to my own shirt and living up to get the proof that I jumped off the highest bungy platform in the world. (Don’t worry, I’ll blog about this in detail later.) Our last dinner in Macau was at the 360 Cafe on the 60th floor. The revolving restaurant, aside from having great food, gives you a great sweeping view of Macau (you can also see people jumping off the bungy platform). A lovely way to ending a trip. Ivan: Onga! I actually find myself wanting to do it again.. Masyadong mabilis pangyayari, wala akong maalala! Macau sounds like an eclectic mix of Asian and European, but somehow very distinct in its own way. I bet their holidays are pretty interesting! Do they typically speak Chinese there, or are there bits of Portuguese mixed in? Chyng: Wag na ipaalala ang presyo! You’re so right! Macau is a gorgeous mix of East and West. They have all these gorgeous buildings that gives you an old world feel, and you have these towering casinos and hotels all light up brightly at night. Yet you can turn one corner and you’ll be in a place that’s decidedly Asia. The main language is Chinese (Mandarin), but the streets names and signs are both in Chinese and Portuguese! There are also plenty of Filipinos working there. We found that in most of the places we went to, there’s at least one service staff who’s Pinoy. You’re so brave! I chickened out there. [standing ovation] that’s my fear, im not sure if i can actually do that. I do read each and every comment posted in my blog, and I do try to respond as best as I can to your questions. You may not see me always commenting here, but I do reply via e-mail. Please understand that I am NOT affiliated with any airline, hotel, restaurants or other services featured here, unless otherwise stated. So if you have complaints about them, it would be better if you contact them directly. Often, their contact details can be found in my post. I’d love to do a bungy jump – I think it’ll cure my fear of heights once and for all. Oh my, I don’t I can do the Bungee…. I meant, I don’t think I can. Wow. What a jump! I can’t wait to read more about it. I’m presently in New Zealand and have bungy jumped a handful of times – but the biggest was the Nevis which was only a mere 134 meters. I never thought I’d say that – until I read about your jump in Macau. Can’t wait to read more about it!